* AUTOMOBILES: Suzuki Motorcycle India, the local two-wheeler subsidiary of Japanese automaker Suzuki Motor Corp, plans to bring in electric two-wheelers to the Indian market by 2020. * AVIATION: Plan to hive off some assets of Air India is still on as the government wants to make the airline a profitmaking company before its divestment, Finance Minister Piyush Goyal said. Airlines are offering flash sales and discounted ticket prices during the traditionally lean monsoon season, despite rising oil prices and the falling rupee as they hope to attract more passengers and make as many advance bookings as possible to feed the capacity that has been added by them in the past couple of months. * BANKING: Unified Payments Interface, the instant inter-bank fund transfer mechanism operated by the National Payments Corp of India, is set to get a major upgrade with new features and a doubling of the transaction limit to 200,000 rupees. The Reserve Bank of India has issued licence to Bank of China to launch operations in India. 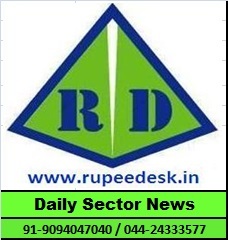 - The Reserve Bank of India's US Treasury holding in April shrank the most in about a year and half, which economists primarily attributed to the RBI's market intervention to support the rupee. Finance minister Piyush Goyal will meet heads of banks to discuss an inter-lender structure suggested under the 'Project Sashakat' that intends to fastrack resolution of stressed assets in the banking system. * CORPORATE: The National Company Law Tribunal adjourned pronouncing the verdict on the long-drawn case filed by former Tata Sons chairman Cyrus Mistry against the investment holding company in 2016 until Monday, where his firms allege mismanagement and oppression of minority shareholder interests. * ENERGY: Following multiple requests from the industry, the Ministry of New and Renewable Energy has extended the timeline for implementation of of solar parks and Ultra Mega Solar Power Projects with total capacity of 40 GW by two years, from the initial deadline of FY20 to FY22, the Ministry of New and Renewable Energy said. * INFORMATION TECHNOLOGY: The indirect tax department is scrutinising capital expenditure incurred by information technology as well as information technology enabled services companies, suspecting they may have evaded Goods and Services Tax liabilities. The recent currency fluctuation is expected to show some positive gains for the information technology sector in their first quarter results starting next week. * OIL AND GAS: Essar Oil (UK) aims to increase gross refining margin at its Stanlow refinery to over $10 per barrel this year due to improved efficiency, Chief Executive Officer S. Thangapandia said. India plans to keep Washington in the loop on the crucial decision of how much oil to continue to import from Iran when the US economic sanctions kick in later this year in order to get a waiver from the requirement of brining down imports to zero. * RAILWAYS: Life Insurance Corp of India will invest up to 260 bln rupees this financial year in the Indian Railways Finance Corp, the market-financing arm of the railroad transporter, through bond subscriptions. * REGULATORY: The Securities and Exchange Board of India has issued a fresh show-cause notice to the National Stock Exchange and some of the key officials including former CEOs Ravi Narain and Chitra Ramkrishna, asking them to explain the allegations of preferential access to a few high-frequency traders and brokers to its trading platform. * STEEL: Lenders to Essar Steel feel that Arcelor Mittal, "a serious and credible resolution applicant", has displayed "a genuine intention and taken concrete steps" by attempting to clear over dues in defaulting firms where it was a shareholder. * TAXATION: The income tax department made record recoveries of 1 trln rupees in 2017-18 (Apr-Mar), contributing 10% to the total direct tax collection last financial year. The Central Board of Direct Taxes has signed three more unilateral advance pricing agreements in the last two months as it looks to reduce litigation by providing certainty in transfer pricing. * TELECOMMUNICATION: Unrest is brewing at bankrupt telecom company Aircel, where theres been no sign of progress on selling assets as the insolvency resolution process passes the midway stage, prompting fears the company may be headed for liquidation.